It's sad to watch a guy you used to think was one of the most positive forces in comics start personally attacking other creators. I even posted on Rob Liefeld's optimism at one stage here. 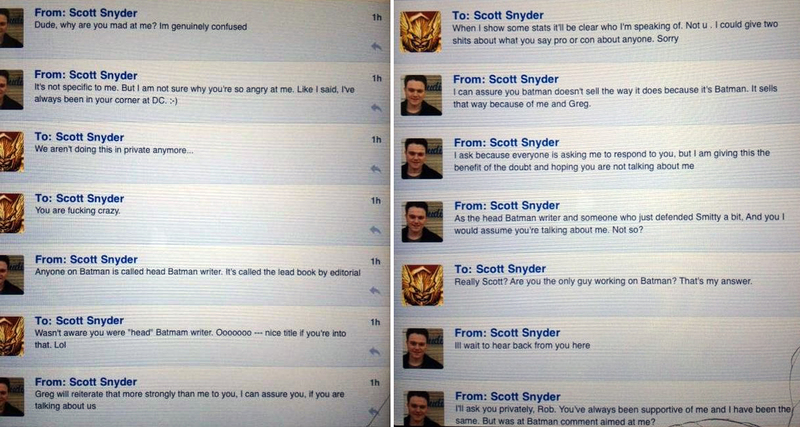 Now continuing his barrage of Tweets following his resignation from DC titles Hawkman, Deathstroke and Grifter (including tweets on the size of a DC editors "pecker" and pot shots at writers Ann Nocenti and Paul Levitz), the 90's hit artist took a private chat with confused hit writer Scott Snyder public, while going on a Jean Grey level meltdown, attacking the current Batman creative team. Yeah I think the phrase you are looking for is 'O.M.G.'. While things were said on many sides that should be retracted, the level to which Rob fires off actually stuns me and causes concern about what the guy could be facing in life to lead to such an all out attack. Personally, I hope all parties takes a break from Twitter (or at least the subject) and let emotions cool to a point where any future perspectives can be exchanged a bit more maturely then in recent days. For what it's worth, Scott Snyder on Batman almost makes me pick up the title consistently and I don't read the major icons save when Grant Morrison is at the helm. So I can see why he's a draw to that title for a sales spike. I maybe bias, but after American Vampire, I would pretty much read the phone book if he wrote it right now. 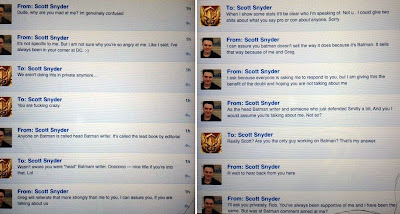 But yeah, he's very wrong for attacking random writers like that. 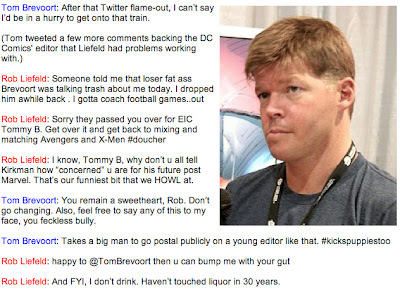 If it was the editors, or more specifically the one he claimed to have issues with then, yeah maybe that's more expected, but then to attack Tom Brevort randomly....what the hell's Liefield on seriously? I think that's probably the major appeal of a concept like Twitter. As you only really read stuff like this for shits and giggles, and to see two or more people fight like a bunch of high school girls. Very funny.Unprofessional as hell, but very funny. To true Dale. Me I love how Scott's trying to the last to be civil, then BAM! in one tweet hands in a major burn. From Bruce Banner to the Hulk in 2 seconds. That's what you get when you cross an awesome writer my friends. Oh, man, that stuff's just horrible. Liefelds come under too much attack recently; much DCs own fault for overpromoting his talents, which for me peaked in the 90s. We could be here until the next reboot discussing his bassoon of dubious artwork married to his writing but thats merely fans opinion; when creators start on each other you know things are going badly behind the scenes. And Dale, you wouldnt be an Angelos Epithiemiou fan would you?!? If you ask me, Twitter should be banned - many celebrities are removing themselves from it becouse its nothing but abuse from followers. I know I've stated before that I never was much of a Liefeld fan. I always thought his writing was okay and if I had to I could cover up most of his artwork and kind of squint through the rest with really dark sunglasses. If I forced myself. But like most people say, that's just personal preference. As a creator he always seemed to me to be mostly smoke and mirrors. Let's take someone else's great idea and change the costume. Hopefully without getting sued this time. I don't know the guy personally, I don't know what he's going through, but someone needs to take away his technology before he does himself and his career so much harm he can't recover enough to create the next ripoff of the New Teen Titans. Seems like we are all on the same page here guys (when are we ever not?). IADW has Twitter and that automatically publishes links to every story published on this site. While it has picked up followers of its own, I don't quite get the site or it's lingo, so I just let it do it's thing. 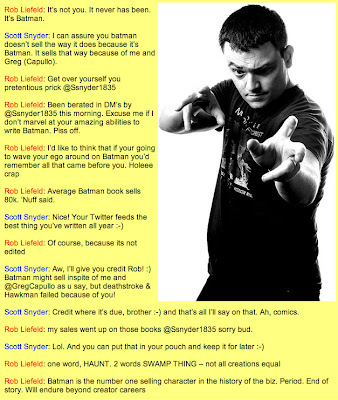 Like most things on the internet the potential it could bring isn't what the majority put it in practise for and I have to feel Rob just shot himself in both feet doing all of this. So Dale mate, Karl's question, what do you reckon? Twitter is a sign of the age. Condense everything into minute soundbites, and let everyone in on the free for all. Unfortunately, this hardly lends itself to decent, well thought out conversation. It used to be you had to look someone in the eye to insult them. Hardly anyone likes to do that. More people than used to these days, I'll admit, but everyone's comfortable doing it in cheap, meaningless snarky one-liners they can toss out at each other as quick as their band width will let them. And the public loves them for it. At least until the next guy comes back with something better. But should it be banned? No. Those of us who don't like it just shouldn't look at it. I really do think it's that simple. It won't go away, but the intelligent people, at least most of them, will find different ways to communicate. Like right here on IADW aye Random! There's always room for one more @Mr.Morbid's House of Fun....isn't that right Dan? Sorry, back onto the topic, yeah down with Twitter. I blame today's generation with that concept. With the new breed of Lazy Capitalism and seemingly disposable technology, this world's headed towards the very future Warren Ellis has warned us about for years now. And isn't that a scary thought? That Mr. Ellis was right all along? Shots on Tuesday? Alright well I cant act like I havent done that before. I do get competitive on the wee blighters though so be warned. I hope everone checks out Dales site, its a great effort on a consistent basis and always worth a chuckle or two hundred. The link in the IADW side bar will be easier to spot in a few days too. Yes, Dale, Dan Renton Skinner is a fine actor and comedian, known here for Shooting Stars and numerous guest spots. He dosent look at all like Angelos in real life tho and has no connection to Ricky Gervais I know off. Thanks for the link - I will check it out. My computer broke recently so I had to do something I havent done for years...write letters! I contribute to a Legion of Super-Heroes APA and had to write out my entire zine. Never again! I do everything on my computer nowadays [that didnt come out right]. Im up for shots, and the next rounds on me. I don't usually drink on weekedays, but I've done it a few times. I had a friend come over one time, early sunday morning with a six-pack of Shlitz, and proudly proclaimed "I brought breakfast!" I at least had the common courtesy to drink one with him. Whatta' going do right? Thanks for the shout out, as yes, I usually, and I stress the word "usually" can bring the funny when I need to. cool, thanks for the further info. Other than the sheer horror of having to write an entire 'Zine out, how did it feel to go primitive for awhile:)? I still write out my skits/ideas for skits with a pen or pencil, so I'm used to hand-writing stuff out. I won't ever win any penmanship awards anytime soon, but I can get the job done. Karl - you write for a Legion of Superheroes feature? That's awesome man - I love the Legion! Tell us more about it or where we can hook up to it! Speakin of which this blog needs more 31st Century don't you think. Random is a major fan too, so I know she'll be keen! I write alot of comic stories on paper and sketch characters, new locations and more. I've created my own universe of characters and stories since I was 11 and I still fill endless txt books now with their adventures and stuff just because I think my mind would explode if I tried to bottle it all in! Hope you're all up and runnin again now. Dale, I once had shots with my old flatmate Meegz against an All Black (Bull Allen) and his mate once and we won. I sure may not have won the World Cup in any sport, but it felt like it that night. Still since everyones keen as host to the idea it's only fair I get a round and shout a pizza, or nachos or somethin' to help wash said tonics down. Legion?! Yes please! Definitely more on the 31st Century's overly abundant and thoroughly confusing (needing the crib sheet I keep handy) group of super heroes. :) I'd love to know where to look that up, Karl. Dan, it's funny you should mention that, I was just thinking the other day, after your last bathroom post, that you don't do enough on the 31st century anymore. And if you really want to remodel, maybe that's the direction you should go. I contribute to my Legion APA 247 - an APAs a self-published zine which comes out about eight times a year and which each member has to contribute towards. Ive been a member for a couple of years now but this year finally began taking part with my zine 'Tales of a Silver Age Snob'. Its a lot of fun with reviews, artwork, fan fiction, quizzes...the olt!